Wharfedale Diamond 155 review | What Hi-Fi? Our first encounter with the Diamond 155s was not favourable: the review units were so poorly finished they ended up with three stars. Since then, we’ve received another pair. We’ve also visited shops for surprise checks. We’ve seen just enough of an improvement to give the Diamond 155s another chance, but quality control is still an issue. The covering, though no longer peeling at the corners, is still untidily applied. The surface is uneven, a result of applying the vinyl wrap to composite chipboard panels. 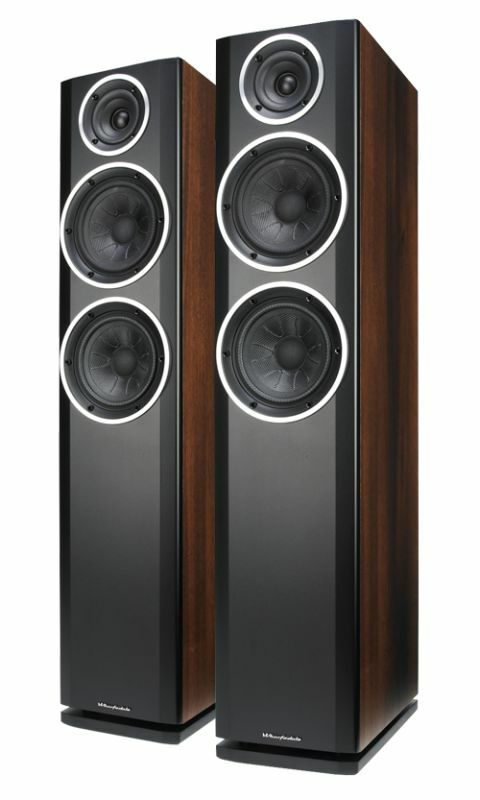 It’s a shame because, finish aside, there’s a lot to admire about these speakers. Their design is well thought-out and must have taken the engineers a lot of time to get right. The solid enclosure is constructed from a combination of MDF and chipboard, which provides better damping, so you hear more drive unit and less box. The drive units are high-quality, too. A 25mm soft-dome tweeter is surrounded by a dished waveguide that helps control the dispersion of sound. Below this sit two 16.5cm drivers – one for midrange and bass and the other helping out at the lowest frequencies. Underneath is a pair of downward-firing reflex ports that exit into a small gap between the cabinet and the plinth. In theory this makes the power-transfer into the room more efficient, leading to better, more powerful bass. It certainly sounds like it works. The Diamond 155s dig deep, giving Massive Attack’s Angel the kind of gut-rumbling bass it deserves. There’s occasionally a little too much, but at least it’s agile… REM’s Losing My Religion displays a level of transparency and directness through the midrange that exemplifies what we’d expect from most floor-standers. There’s also plenty of treble detail, with impressive integration throughout the spectrum. Dynamics are a joy. They also do well in terms of rhythmic precision. Load up Green Day’s Welcome to Paradise from their Dookie album and the Diamond 155s maintain a sturdy grip of timing throughout some challenging drumwork. Add that to a pleasing sense of scale and dynamics, and you have something that sounds pretty special. To get the most from the 155s, toe them in slightly towards your listening position, and biwire them for extra transparency and openness. Make sure to keep them away from the wall in order to control the bass, too. Overall, we’re very impressed by the 155s’ performance. In fact, we think they sound better than some other floorstanders we’ve tested recently. But as much as we like the sound, we can’t ignore the build quality, which falls below what we’d expect from the price. We just can’t bring ourselves to unreservedly recommend these until Wharfedale sorts that out.